As I mentioned Monday, this past weekend Parker and I threw a spooktacular Halloween party! We have been so excited to finally host a get-together in our new home, and nothing gets people excited like Halloween. Dressing up and eating weird food concoctions... tis the season! We (read: I) scoured the interwebs for Pinterest-worthy food items to serve and came up with a list I felt good about. The goal was to find food that looked pretty and tasted great but that required minimal effort to put together. I thought it would be fun to share some pictures of our favorite dishes, so let's get to it! 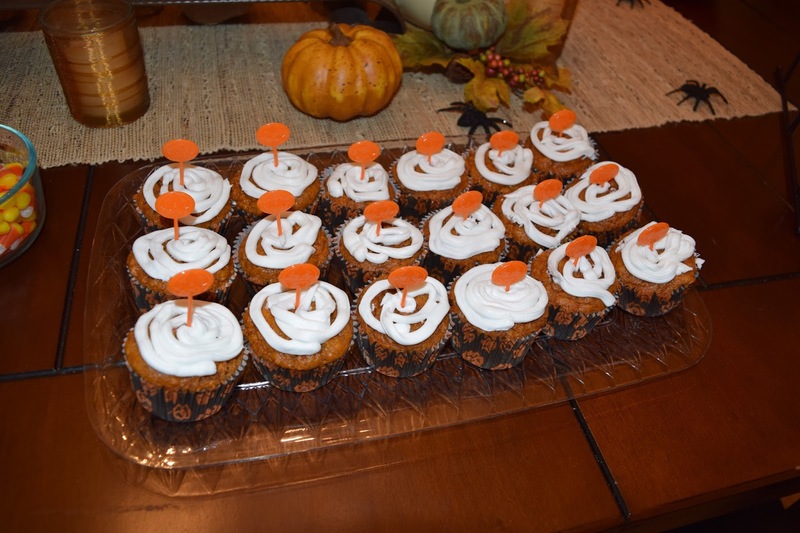 There had to be some pumpkin on the table, so these pumpkin cupcakes were just the ticket! This one shouldn't even count as "homemade". 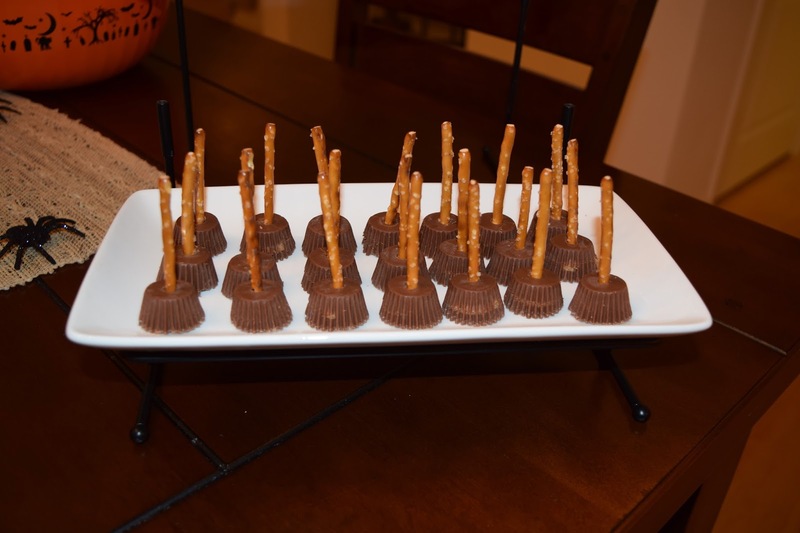 Stick a pretzel stick into a Reese's PB cup, and I give you... witch's broomsticks! This is another nice and easy one. 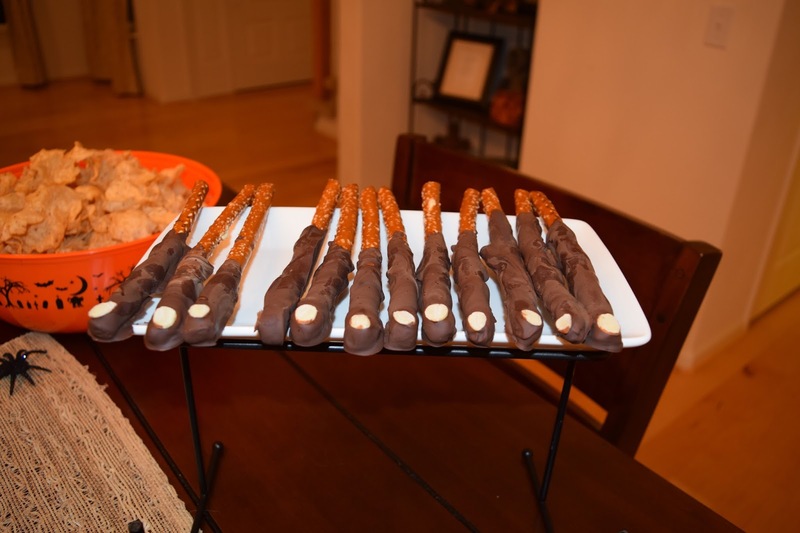 Dip pretzel rods into melted chocolate and add a sliced almond at the end, and you have... chocolate fingers! This was the snack I couldn't stay away from all night. 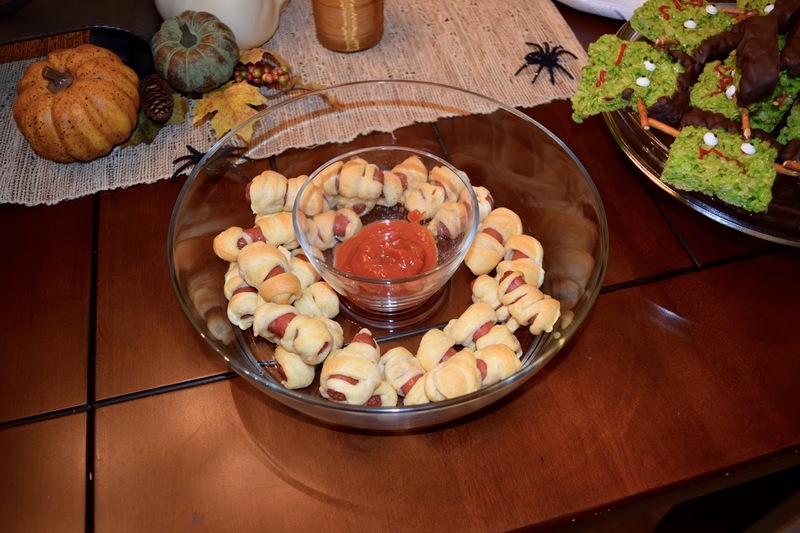 Wrap pieces of crescent roll around little smokies, and you get... mummies! Really, you get glorified pigs in a blanket. Whatever you choose to call them, delicious! I was pretty excited about this next one. I made a batch of rice krispy treats, used a little green dye, cut them into squares, and dipped the ends into melted chocolate. 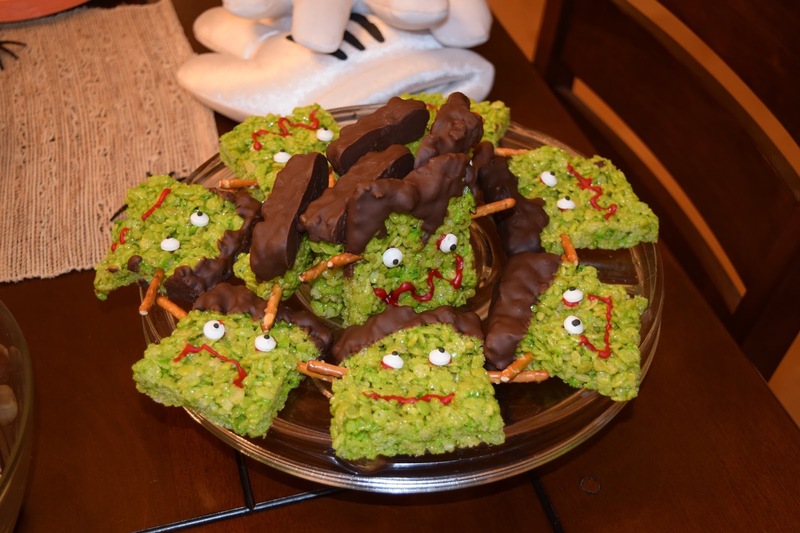 A little of this and that, and I give you... Frankenkrispies! 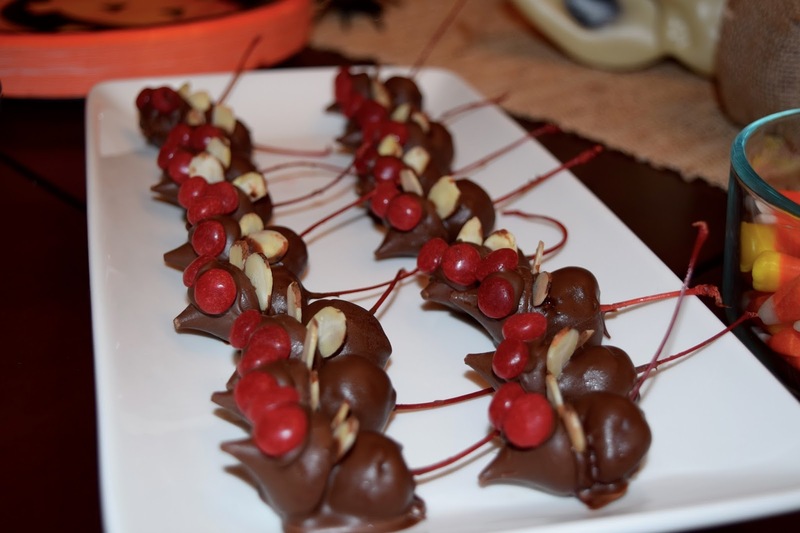 These chocolate mice were definitely the most involved, but they came out looking so darn cute. I got the recipe from my friend Jen and knew I needed to serve them for the party. Is it possible for something to be creepy yet cute and appetizing at the same time? Because I think these chocolate mice are just that. I am so glad I took a picture of this last one, because it was gobbled up in .05 seconds. 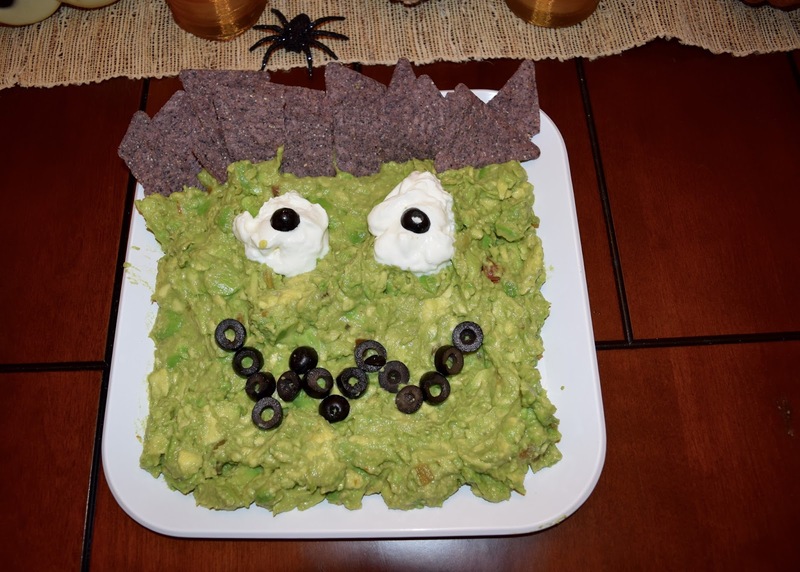 A fresh batch of guacamole, sour cream, olives, and a few chips, and I give you... Frankenguac! 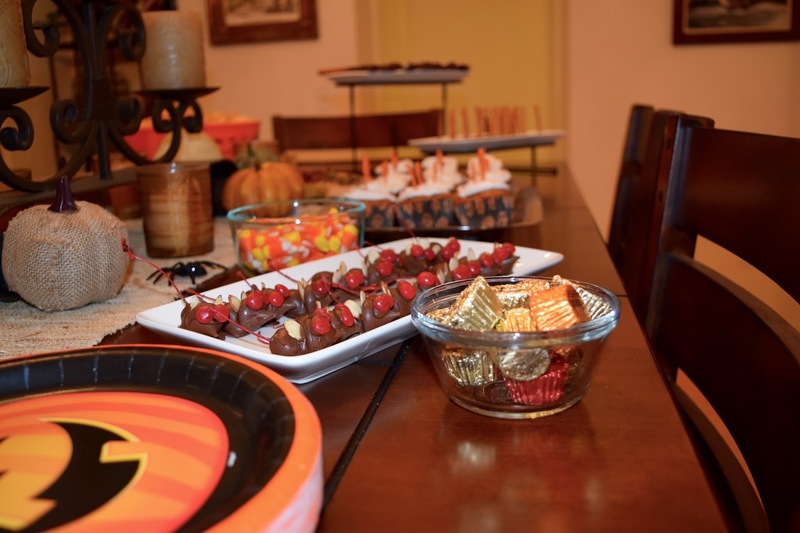 We had a blast planning this party and really getting into the Halloween theme. It really is all in the details! Our friends got into it as well, and by the time everyone had arrived, the number of dishes on the table had doubled. We had pumpkin dip, pumpkin cookies, and candy galore. Hello, sugar high. Maybe there is a reason Halloween only happens once a year. I always want to do fun treats for Halloween but never do!!! These are adorable! Okay your frankenkrispies, chocolate mice, and Frankenguac are KILLIN' me!!!! They are so stinkin cute and make me want to have a Halloween party this weekend just so I can make them!! Definitely going to remember this post or next Halloween! Okay sooo..I'm totally coming to your next party! All of your treats turned out so dang cute! 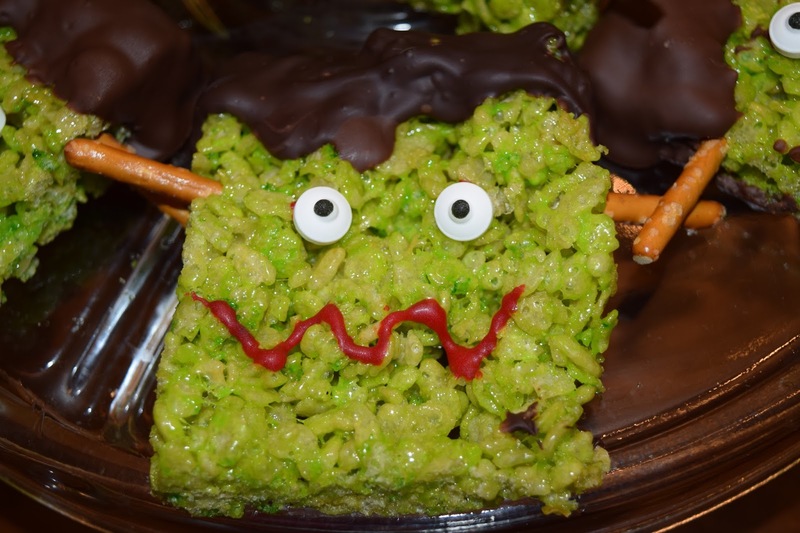 My favorite are the mini rice krispie Frankenstein's and the guac! This is so great!!!! Totally pinterestworthy! Can I hire you to make the food for all of my future parties? This looks AMAZING!